Does anyone know where I would be able to find a engine wire harness for 1987 c4? I cant seem to find anyone who has them? the engine harness that controls various things around the engine compartment..
there are a lot of corvette junk yards around... there is a problem.. to aiming you in the right direction... where on the planet are you???? 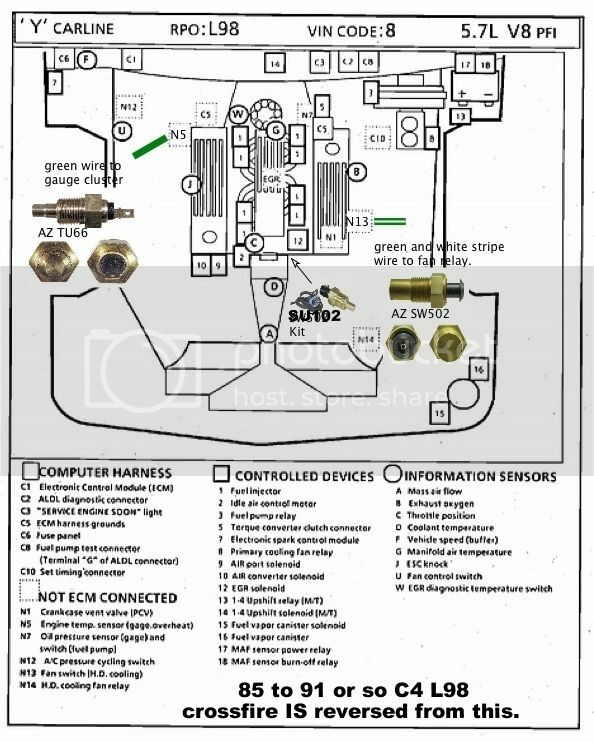 there is one thing... i hope that you know.. that almost every connector is available as a pig tail... so you can repair your existing harness..
check your private messages just to the left of where you log out at..
the passenger side gets the temp sender for the cluster. with a flat 1/4" push on connector..
notice the front of the intake with the engine coolant temp sensor in the front of the intake manifold.. is an SU102 kit.. it has 2 wires on it..
the coolant temp sensor returns voltage from the 5 volts sent to it by the ecm to the ECM.. changes in coolant temp change the resistance and the voltage returned to the computer..